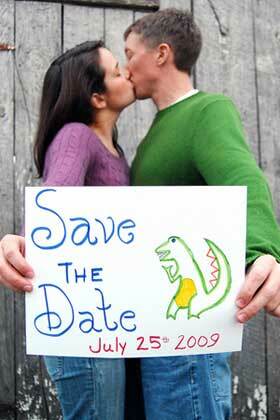 Save the Date cards with a photo of the soon to be wed couple is a great idea. 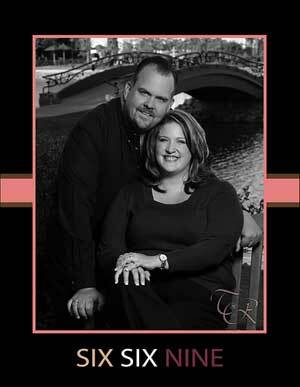 Friends and family will absolutely love to receive a photo card in the mail that you have made yourself. Don't think that you have to go out and hire an expensive photographer to take your picture either. All you really need is a camera, a friend with a steady hand to take your pics and a great pose. If you can take care of the camera and friend part, we should be able to help you with the rest. Once you have the picture in order you can head over to Vistaprint.com to print off your cards / postcards. See this tutorial for more details on how to do this. This save the date card was super easy to make! My friends made the sign on a piece of heavy cardstock paper. They were careful to make the letters bold so they'd be easy to read. Then I took the picture of them holding the sign out. I had to make sure there was a nice background behind them -- in my picture they stood in front of a shed that had some nice texture to it. I would recommend finding simple backgrounds like walls or open field areas to keep the background from being distracting. My husband is actually a graphic designer, and my sister took the photo. She took the picture of us holding blank white pieces of paper in front of a green wall, and my husband edited the photo using Adobe Photoshop. I used a combination of Adobe Illustrator and Paint Shop Pro to create the invitations that I used, and then used Vistaprint.com to make the magnets and the cards. 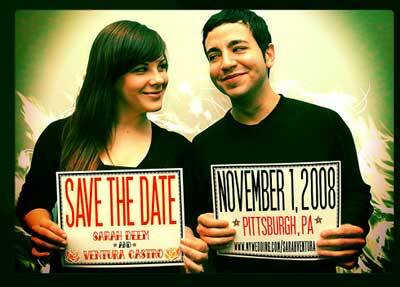 I also plan to continue a similar theme with our invitations, which have yet to be created. In this photo the pets save the date. Two cards are made up along with ribbon to place around the dog and cats neck. The dogs sign says 'Leshia & Kevins Wedding" and the cat's sign has the wedding date printed on it. The words 'Save the Date' have been added after the picture was taken. You can do this by inserting the image into a word document and then create a text box to hoeld the text. If you have image processing software then all the text can be easily added to the photo. Use the Transform->Warp tool to let your text curve with the signs and look more natural.